Like Tres Chic, Fontainebleau is also from France's Provence. When it comes to Rose, it's hard to escape this area, as it's been a staple here for hundreds of years. And all it does is get better. Fontainebleau stands out as one of the most progressive chateaux in France. Everybody says that the wine is made in the vineyard, but few actually follow this down to every detail like Fontainebleau. The chateau is not only organic, but biodynamic as well. Biodynamic farming has been called a lot of things from a cult to a religion and even a savior. The term was first coined by Rudolf Steiner, a German scientist and philosopher whose mantra was that one must look at the entire vineyard as a living organism.To that end, everything that is done here is not just for the benefit but also for the livelihood of the vineyard. Biodynamics takes in the position of the moon, stars and planets to project what to do - and when - to the land. Some look at it with skepticism, but many of the greatest wines in the world come from biodynamic vineyards. Biodynamic or not, our selection is a beauty. 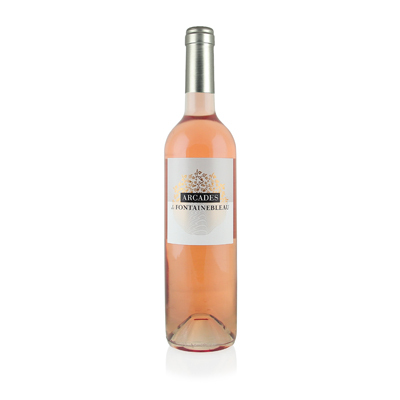 Made from the classic crucible grapes of 50% each Grenache and Cinsault, our selection offers enough engaging light flavors of pink grapefruit, white peach, lime and strawberry to fill a fruit basket. The beauty of Roses is that they can match any food from chicken Parmesan to veal Oscar or grilled swordfish.